Any registered voter may vote using a vote-by-mail ballot instead of going to the polls on Election Day. To request a vote-by-mail ballot for a single election or to request a vote-by-mail ballot for all elections (permanent vote-by-mail voting), follow the simple process described below. Before you may request a vote-by-mail ballot, you must be a registered voter. If you believe you are already registered, you can verify your registration online with our “My Voter Status” tool. If you are not already registered, you can register online at RegisterToVote.ca.gov. As part of registering to vote, you are given the option to become a “permanent vote-by-mail voter,” which means you would automatically receive a ballot in the mail before each election. 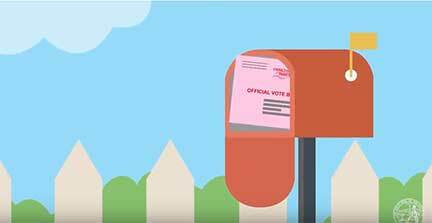 Registered voters may apply for a vote-by-mail ballot for an upcoming election at any time. If you apply by mail, your application must be received no later than 7 days before Election Day. You may use the application printed on the voter information guide that is mailed to you by your county elections official prior to every election. You may also visit or write to your county elections official for an application or you may use the California Vote-By-Mail Ballot Application (PDF). Before a presidential primary election, a No Party Preference (NPP) voter may use the California Vote-by-Mail application (PDF) to request the presidential ballot of a political party who is allowing voters to vote their party’s ballot. For more information visit our No Party Preference Information page. After reading the instructions, type your information directly into the application, then print, sign, and date the application. Mail the completed application to your county elections office. Please do not mail it to the Secretary of State's office because this will delay receipt of your vote-by-mail ballot. Any time after 7 days before Election Day, you will need to apply in person at your county elections office to request a vote-by-mail ballot for that election. Contact your county elections official to see if your county allows you to apply by telephone. Once your application is processed by your county elections official, your ballot will be sent to you. Any registered voter may vote using a vote-by-mail ballot instead of going to the polls on Election Day. After you have voted, insert your ballot in the envelope provided, making sure you complete all required information on the envelope. When your vote-by-mail ballot is received by your county elections official, your signature on the return envelope will be compared to the signature on your voter registration card to ensure they match. To preserve the secrecy of your ballot, the ballot will then be separated from the envelope, and then it will be tallied. All valid vote-by-mail ballots are counted in every election in California, regardless of the outcome or closeness of any race. For additional information on how and when ballots are verified and tabulated, please visit our description of how the official canvass of the vote is completed. If your identity cannot be verified, then your Vote-by-Mail ballot envelope will not be opened. For more information on identification to use when you vote for the first time, check the complete list of acceptable forms of identification (PDF) or call the Secretary of State's toll-free voter hotline at (800) 345-VOTE (8683). California Elections Code section 3017(c) requires county elections officials to establish procedures to track and confirm the receipt of voted vote-by-mail ballots and to make this information available by means of an online access system using the county's elections division web site or via a toll-free telephone number. Your permanent vote-by-mail status will only end if you do not vote in four consecutive statewide general elections. If you are currently registered to vote as a permanent vote-by-mail voter and would like to cancel your permanent vote-by-mail status, you can complete the California Permanent Vote-By-Mail Status Form (PDF) and submit it to your county elections office. If you have any questions, you can contact your county elections office or the Secretary of State's Voter Hotline at (800) 345-VOTE (8683). Please note that if you live in a county that is participating in the Voter’s Choice Act (Madera, Napa, Nevada, Sacramento and San Mateo) you will be mailed a ballot for all elections. For additional information, please visit our Military and Overseas Voting Information section. The Secretary of State's Guide for Conducting a Vote-By-Mail Application Drive is designed to help political parties, vote-by-mail registration drive coordinators, petition management companies, and professional and volunteer circulators understand their responsibilities and requirements when helping people apply to vote by mail in California. The Guide contains the uniform statewide California Vote-By-Mail Ballot Application (PDF). Applications used by people, groups, or organizations must use the required format or they may be deemed to be invalid. Please follow the Instructions for Completing a California Vote-By-Mail Ballot Application (PDF) to ensure the application is completed correctly. Please do not return applications to the Secretary of State's office. Applications must be returned to the elections official of the county where the applicant lives. If you have any questions regarding these forms, please contact the Secretary of State's Voter Services Unit. Beginning in 2018, the first counties in California will begin the transition to the Voter’s Choice Act, in which all voters in those counties will receive a vote-by-mail ballot. Now, more than ever, there is a need for vote-by-mail envelope uniformity. The Center for Civic Design, in partnership with the Secretary of State’s office, has created a universal vote-by-mail envelope package. This package includes designs of the outgoing vote-by-mail envelope and return envelope, as well as voter information inserts. The intent of the design is to create a flexible template that a county can adopt and use, regardless of whether or not they are implementing the Voter’s Choice Act. The Secretary of State is encouraging all counties to implement the new designs into their vote-by-mail packages. The Center for Civic Design has provided layouts (PDF), InDesign templates of the outgoing (ZIP) and return (ZIP) envelopes, and guidance documents (PDF) for counties to use in implementing this new universal design. They have also provided sample voter information inserts (PDF) to use in your vote-by-mail packages. *Please note the individual county elections offices provided these numbers. Because not all counties provided information, no complete statewide data is available.